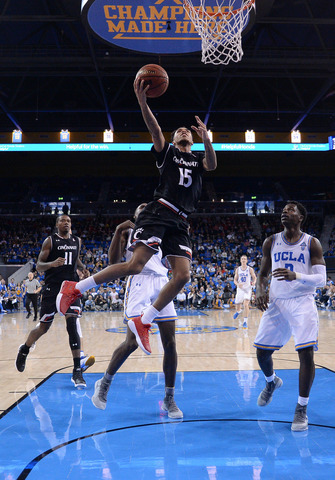 CINCINNATI -- It’s taken two players for the Cincinnati Bearcats to replace Troy Caupain at point guard, but Mick Cronin hasn't looked for one man to take over the position. Starter Justin Jenifer shares equal playing time with fellow junior Cane Broome, who sat out last season after transferring from Sacred Heart, and Cronin likes what both bring to the floor. Jenifer is a pass-first player averaging 5.3 points and 2.6 assists per game, while Broome is more of a scorer with 7.7 points and 3.0 assists per game, but the duo has been key on both sides of the ball, helping UC (23-2) to a No. 5 ranking in the Associated Press poll this week. 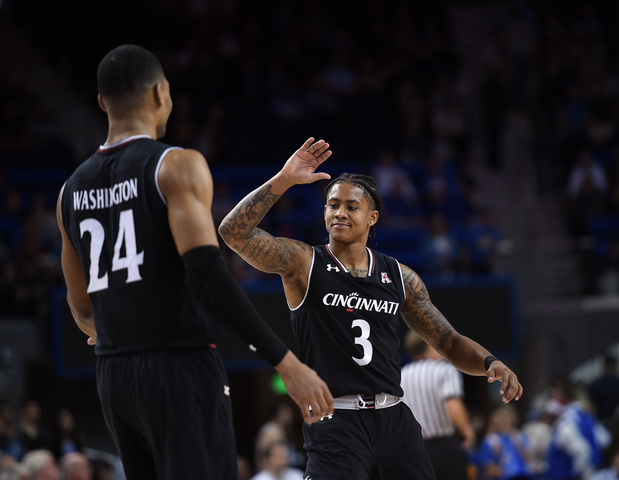 The Bearcats play at Houston on Thursday, looking to remain perfect in American Athletic Conference play before heading home for a three-game stretch. “They are doing great,” Cronin said. “I think what people don't realize is we ask them to do two things -- take care of the ball and pressure the ball. They expend a lot of energy pressuring the ball defensively for us, and that has led to a lot of our defensive success because that causes a lot of disruption. Teams can't just flow into their offense. Cronin originally anticipated the two playing together more, but with Broome checking in at 6-foot, 165 pounds and Jenifer listed at 5-foot-10, 175 pounds, their size makes it hard to do so. Cronin instead rotates the two to keep both fresh, then goes with the one who fits best in the flow of the game to start the second half. It might seem like rotating players with such different strengths would disrupt Cincinnati’s offense, but that hasn’t been the case. Shooting guard Jacob Evans, who played point in high school, said it’s a smooth transition from one to the other. “They are that dynamic duo point guard,” Evans said. “They are both these two Energizer bunnies, but they play different. Off the court, the two point guards have become close while rooming together in an apartment-style dorm. They enjoy watching "CSI," "Law & Order" and NBA games on TV together, and both complimented the other’s cooking abilities. Broome says Jenifer is the better cook but Jenifer likes when his roomie makes breakfast, especially Broome’s special cinnamon rolls baked in a waffle maker. It’s a friendly competition between them on the court. “It's cool because there's a little battle between us being point guards and both in the same class, so every day we compete when we're out here, regardless of us being friends, and make each other better,” Jenifer said. Broome thinks their styles complement each other well. Jenifer spent the last two seasons learning from Caupain, playing in 35 games last year as a reserve and averaging 2.8 points, 1.9 assists and 1.0 rebounds in 12.7 minutes per game and posting similar numbers as a freshman. Broome watched from the sidelines last year because of transfer rules but had a big adjustment to make this season after playing a much larger role at Sacred Heart. The 2015-16 Northeast Conference Player of the Year ranked eighth in the nation in scoring at 23.1 points per game his sophomore season before transferring. The move was well worth it to Broome, though. He and the Bearcats are on their way to the program’s eighth straight NCAA appearance, where they are currently projected to be a No. 2 seed. Cronin has seen big strides from both Broome and Jenifer since the beginning of the season and expects them to both play significant roles as the season progresses. “They have a lot more confidence and they are a lot more comfortable,” Cronin said. “They needed game minutes, and they needed big game minutes to where you're not nervous out there. I think they are past that, and they are understanding what we want from them on the floor, and on the defensive end, especially, they have grown. Even though their scoring statistics are not gaudy like Caupain’s double-figure averages, Cronin said the team’s shooting percentage has remained high (45.5 percent, compared to 45.8 percent last year) because of good decision-making at the point guard position. Jenifer credits the other players for making it so easy for him and Broome to run the offense.